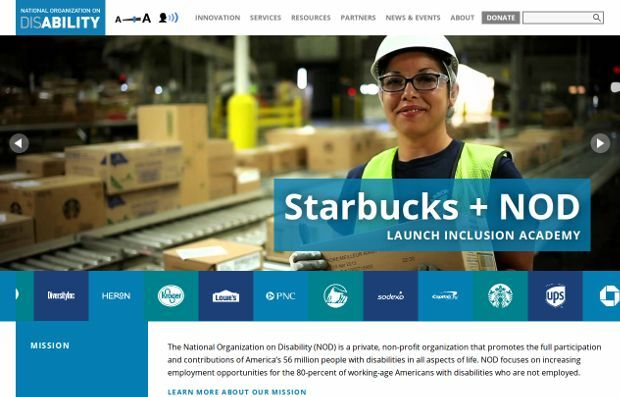 The National Organization on Disability (NOD) is a private, non-profit organization that promotes the full participation and contributions of America’s 56 million people with disabilities in all aspects of life. Today, NOD focuses on increasing employment opportunities for the 79% of working-age Americans with disabilities who are not employed. Founded in 1982, NOD is one of the oldest cross-disability organizations in the country, and remains one of the few organizations committed to representing all Americans with disabilities, regardless of their particular condition or circumstances. With programs on the ground, NOD is demonstrating new employment practices and models of service delivery, evaluating results, and sharing successful approaches for widespread replication. Their subject matter experts in disability and employment provide consulting services to employers and public agencies seeking to harness the unique talents that people with disabilities, including many veterans, can bring to the workforce. They are also conducting research on disability employment issues, including the field’s most widely used polls on employment trends and the quality of life for people with disabilities. To achieve their goals, they work in partnership with employers, schools, the military, service providers, researchers, and disability advocates.